Calum Butcher, right, in action. Calum Butcher has told Dundee United not to be scared of winning ugly if it takes them all the way to the Championship title. 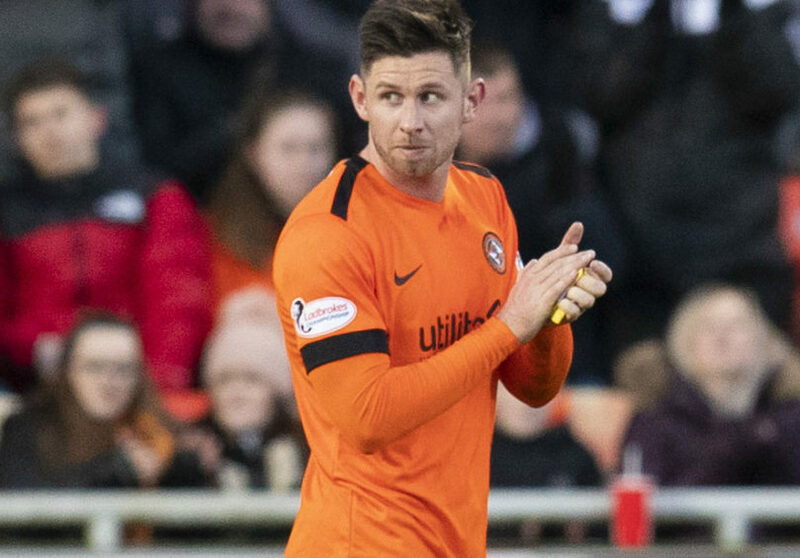 Butcher helped Robbie Neilson’s men scrape past bottom club Alloa 2-1 on Saturday thanks to Nicky Clark’s 87th-minute winner in what was far from a Tannadice classic. 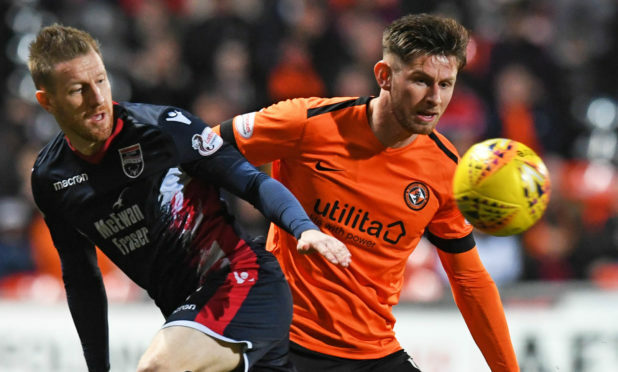 The Tangerines have managed back-to-back victories, having defeated league leaders Ross County 1-0 a week ago, and now have the chance to cut the gap at the top of the table to just two points when they head for East End Park to face Dunfermline tonight. Midfielder Butcher, who rejoined United in January, has his sights set firmly on sealing automatic promotion back to the top flight and insists he will happily sacrifice polished performances for precious points during the run-in. Butcher said: “We will have to win ugly at times if we want to win the league – of course – but winning ugly is the same as winning any other way. It’s all about getting three points. “We need to show character like we did on Tuesday and Saturday because that saw us collect six points. “We have seven games of the league campaign to go now and we will need to show the same mentality. Calum Butcher in action for Dundee United. “Saturday was a massive result for us after the win over Ross County. “It was huge for us as we knew we had to follow up with another big result. “Alloa are a tough team to break down. They have a good shape and we knew we would have to be patient. County, who don’t play again in the league until this weekend. Butcher reckons their relentless run of games is working in their favour. He added: “It is a hectic schedule just now but we prefer it that way. “It’s Saturday-Tuesday, Saturday-Tuesday and you don’t really have time to think about anything else. try to get the points on board. “At the moment, we feel like the momentum has swung in our favour. build on it and we did. keep piling the pressure on. “No matter where we end up, we want to build momentum going into the final games. “It might go all the way to the play-offs so we need to keep building. succeed in moving to within two points of them tonight. now with us breathing down their necks. “There was a lot of change here in January, with a lot of new players. Everyone had to find their feet but you can now see more rhythm to what we are doing. 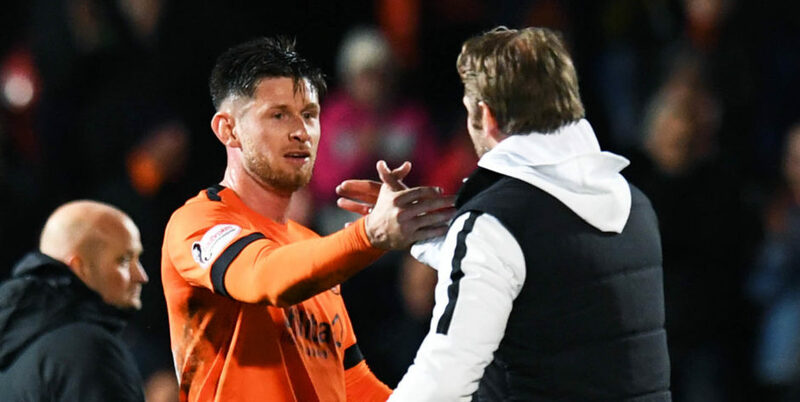 Dundee United manager Robbie Neilson (R) congratulates Calum Butcher at full-time after playing Ross County. “We are seeing the benefit fitness-wise now and I think we have gelled quickly. “Personally, it was very easy to come into the dressing-room and settle. “The boys made me feel very welcome and when there is so much quality it is easier to gel on the pitch too. “The last two games answered any questions about our mentality. “After the Partick game, a few people wrote us off but that gave us a burning desire inside to right a few wrongs. “The gaffer gave us a rollicking and rightly so but we had to turn it around. Meanwhile, Slovakian striker Pavol Safranko is set to return after being away on international duty.